How simple, but how difficult to follow? That is not the case may be when all things are gong pretty fine.Yes. But on a bad day/bad time, upon slightest disturbances at times, is it the same? A tough person also might stumble and forget that just "one smile" can brighten your day/time or the disturbance that haunts you. Easily said than done? It does cost some effort though. Yes. It is right to or necessary to nurture mixed feelings, and all kinds of sensitivities perhaps. Similar based thoughts appear in my older posts too here and there . Mind is a wanderer. And each one has mood swings in various doses, slightest to major. Sometimes we like to let go off the mind to wander. Its nice that way too, remember, we need to catch the reins soon. This is the catch. Life is not a garden of roses after all. Go through the thorny bushes too! HOLD ON- Am not continuing on philosophical lines. We are all ware of such tricks & treats to capture our vulnerability. At times I simply .....remember -'simply forced a smile(no-not a fake smile either)' and this made my life pretty easier. I breathed easy, hummed my favourite number. Some things at times that made me mad clench my teeth, made me smile too. Someone grabbed my parking while I still indicated & was heading to it! Am driving but my hubby or/any XYZ is a side seat driver! A bunch of neighbouring kids made hell lot of noise in my apartment corridor! I notice any guile person exploiting a weaker ! I notice someone abusing waiters in restaurants ! I catch my kid whining over a breakfast I packed she dint like! SMILE-and it costs nothing but few lesser muscles to work on than a frown is what I had been reading in books since school days. What ever is the math about the energy, the smile does make a difference to us. Doesn't it? Believe me, smiling always is an art or an born gift to some people. Pleases the opposite person too. At least me. The positivity, the inner thrill that it spreads is worth rejoicing. Mother Teresa says-Let us always meet each other with smile, for the smile is the beginning of love. Had read something like this long back in some book [cant remember it sorry]- A bland or a fake smile acts like a green light at an traffic signal, it feels good , but you forget it the moment you're past it. But some smiles touch your heart straight. They sustain and can be cherished always. Has anybody listened to Charlie Chaplin style smile number?. I like it a lot. 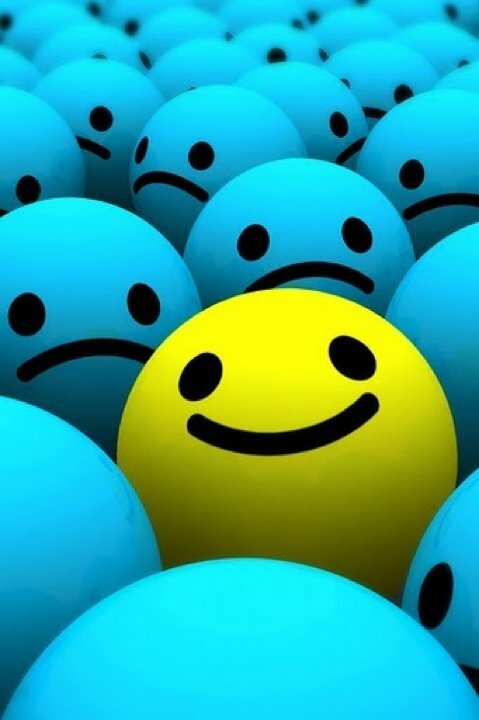 I want readers to notice the yellow smiling guy heads all the blues of frowns. One smile can brighten up your rough times. Lets share this with all our dear near ones. Say Cheese- SMILE- Click.